Excavating jobs require a lot of force. Digging up the ground for a foundation, breaking through cement pads, or drilling into a mine, all require different amounts of force with a varying type of attachment. While many seasoned construction workers might have instincts on which attachment is best for individual jobs, others need to do some research first. The main tools are hydraulic hammers, a multi-processor, hydraulic shear, and a hydraulic pulverizer. Here is a brief guide on which jobs are best for each option. This is a very popular tool because of its versatility and reliability. Adding a hydraulic hammer attachment to a carrier can give you great results, but there is still a variety inside this category. One size does not fit all when it comes to hammers. Just as a small hydraulic hammer can’t do a big job efficiently, a big, powerful hydraulic hammer can’t do a small job accurately or gently. There are three basic classes; large, medium, and small. Large class: This is the size that will give you the biggest bang for the least amount of hits. If you have a job that requires big breaking, you will most likely require a large class hydraulic hammer. They weigh more and have 2300-2610 PSI in the canister. The working weight is over 5000-7500 pounds, so these are heavy duty attachments. With a lower, stronger hit, the different models will range between 200-400 BPM. This is ideal for breaking into large stone walls, thick layers of clay in the ground, and other massive jobs. Medium class: This is the best class for versatility because of its ranges with a 370-700 BPM and 2175-2610 PSI. The working weigh ton a medium class attachment is generally between 1900-3700 pounds. The impact frequency is higher than a large class, but it has a slightly less powerful PSI to give the handler a bit more control with impact. This size is ideal for breaking landscaping boulders, utility jobs, and rental equipment. Small class: Smaller jobs require less power and higher hits. The smaller hydraulic hammers usually have an impact frequency between 400 and 1200 BPM with less pressure at 1400 to 2175 PSI. The working weight is between 400-1200 pounds, which gives more versatility for smaller jobs with smaller carriers. You can use this size outdoor or indoor on a smaller demolition project, like stairs, concrete patching jobs, and digging smaller holes in the yard. This excavation attachment is unique because it has different functions. A multi-processor has strong power, the ability to grab, and the ability to rotate. With these qualities, it can lift and pull rocks, tree trunks, beams, and more out of your way during the excavation job. These are durable and work fast which means it is a great tool to keep on hand for different job sites. During an excavation, not everything can be broken by hitting it. For jobs that need cutting, like cutting steel structures or pipes, hydraulic shears are the best tool. These can help optimize the cost of the job because it speeds everything up, taking less manual labor. You can do it all with less downtime and using this attachment on a job means less manual effort to remove metal in the way. 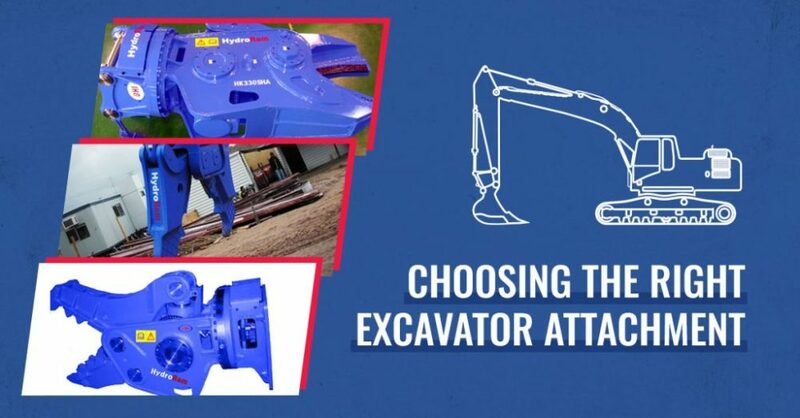 If a job site requires breaking up rubble from concrete columns, retainer walls, building or foundations, the attachment you need is a hydraulic pulverizer. These tools have wide and powerful jaws that can take on many different construction materials. They are available with fixed positions or a rotating design to reach into different openings. If you have a construction job but are unsure of which attachment to use, we are happy to help. Our staff is trained to help figure out which attachment and class size are right for each job. For specific brand questions, our staff can either help answer those questions or refer you to the right source.